My family recently had our first chance to hop aboard the free Holly Trolley and my kids loved it! 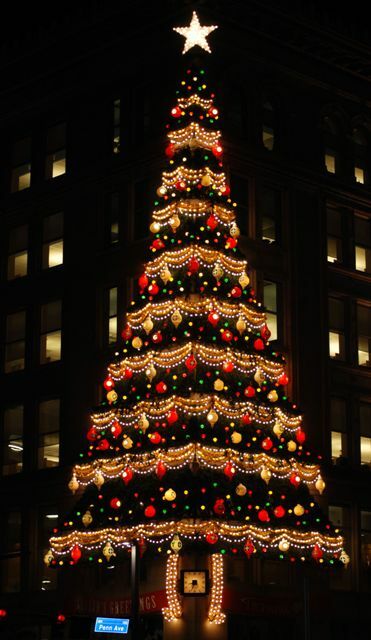 If you've been doing a lot of walking around downtown and feeling a little chilly, it's an excellent chance to rest and warm while still seeing the sites around Downtown Pittsburgh. 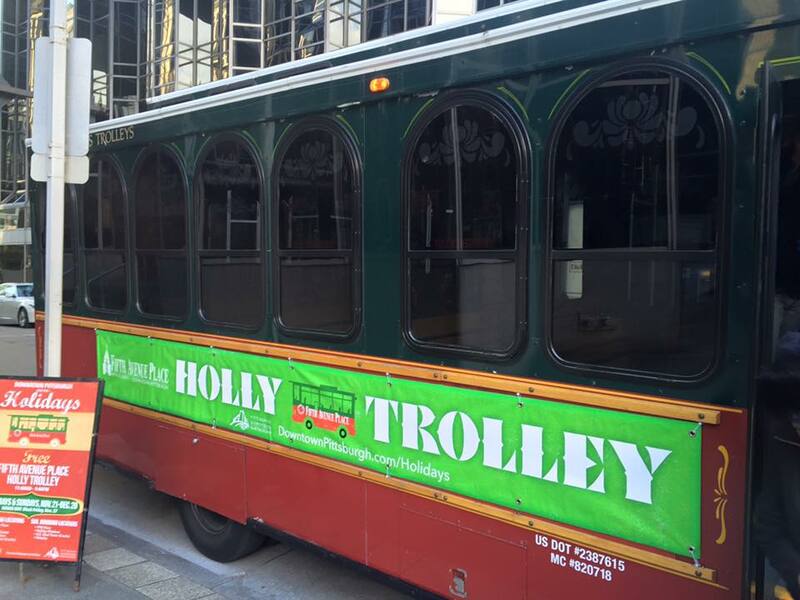 11 a.m. – 5 p.m Discover all the sights and sounds of the holiday season in downtown Pittsburgh aboard the FREE Fifth Avenue Place Holly Trolley. 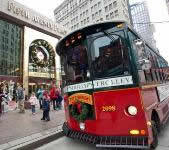 Hosted by Santa’s little helpers, trolleys circle downtown each weekend picking up at stops approximately every 15 minutes Visit www.downtownpittsburgh.com for a listing of all trolley stop locations. You also don't want to miss a chance to head into Fifth Avenue Place for their free kid's activities! Take advantage of the indoor bathrooms and food court while you're inside as well. Reflect upon the warmth of the holidays with The Children’s Museum of Pittsburgh by creating triangle leaves for a treasured “Thank You” Tree. Capture the seasonal spirit with a keepsake caricature and be amazed as magician Chris Handa brings holiday magic to life! Join cheerful elves from the Children’s Museum of Pittsburgh and design personalized holiday wreaths. Showcase your talent and create your very own snowmen snow globe. Catch up with everyone’s favorite elf for creative balloon art and test your skills at North Pole corn toss. Visit for story time and enjoy holiday classics as read by Mrs. Claus. Design one-of-a-kind ornaments and create ice paintings with The Children’s Museum of Pittsburgh. And show off your holiday spirit with a fun face painting. 12 p.m Daily Live musical performances from some of Pittsburgh’s favorite artists bring the sounds of the season to life during the always entertaining Lunchtime Concert Series. He's back! Pittsburgh sports author and historian, Jim O'Brien returns to Fifth Avenue Place. Meet him in Center Court December 10 and December 18 autographing all of your sports collection favorites include Jim’s newest book, Golden Arms: Six Hall of Fame Quarterbacks From Western Pennsylvania. Only a few shopping days left! Find the perfect gift at Fifth Avenue Place and earn a FREE Fifth Avenue Place Gift Certificate with qualifying retail purchases. Redeem receipts from 11 a.m. – close in Center Court. The much anticipated holiday sale returns. Visit Fifth Avenue Place Monday, December 7 - Friday, December 11 and explore the world of glass art – from ornaments and paperweights to vases and bowls. Crystal River Gems will be selling a variety of hand-crafted gift items exclusively from Glass Eye Studio. Help make a child’s wish come true this holiday season! 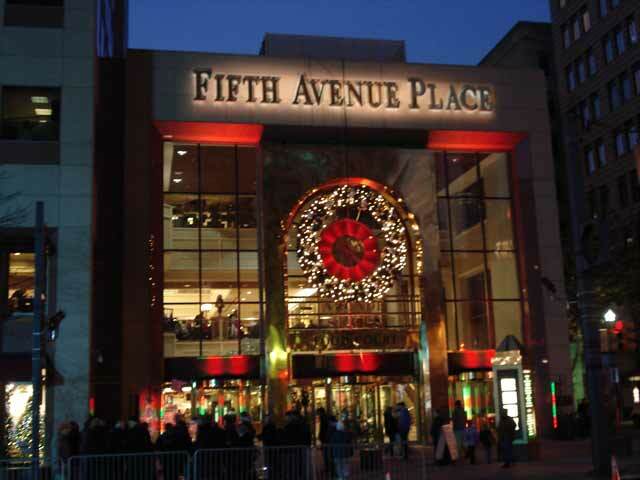 Drop by Fifth Avenue Place for the annual Make-A-Wish fundraiser with WISH Radio, broadcasting live from 6 – 9 a.m. in Center Court, collecting donations and raising awareness for Make-A-Wish. All Day Saturdays Enjoy FREE Parking with any $20 Fifth Avenue Place retail purchase in the Fifth Avenue Place Garage on Evenings (enter after 4pm) and Weekends. This post sponsored by Fifth Avenue Place. All opinions remain my own as I don't endorse venues I don't love! Their manager rocks! Thanks to their great team, I'm so happy I choose this venue for my event! I had a great time at NYC venues and think the atmosphere is as good as it gets. I will be astonished if I ever find a negative review on these guys. The equipments of trolley which are modern, efficient and easy to use will definitely allow more precise services and save time in many places. great information, these are really different and easy to use.